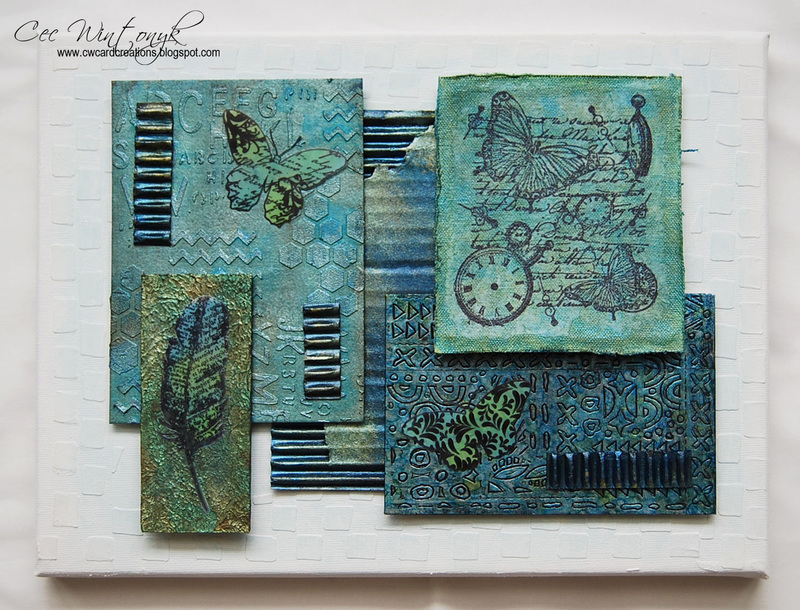 Welcome to today's Guest Designer, Alison ! 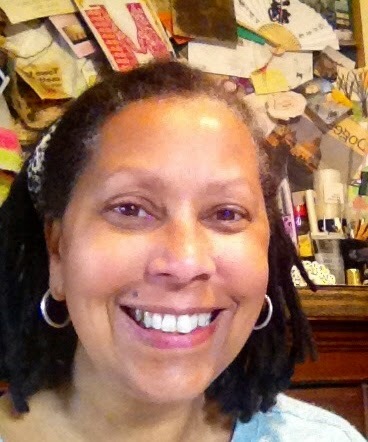 Today we are welcoming Alison of Words and Pictures, as our Guest Designer. Alison was chosen by the DT as the winner of the Splatter, Smoosh and Spritz challenge and invited to join us as Guest Designer. So, I'll hand over to Alison ! Hello all! 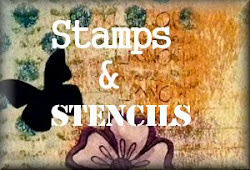 I was absolutely delighted to be invited to guest here at Stamps and Stencils. I think it’s a brilliant challenge, the team includes so many fantastic crafters, and the inspiration projects are always incredible. And I loved Autumn’s challenge of Trash to Treasure. 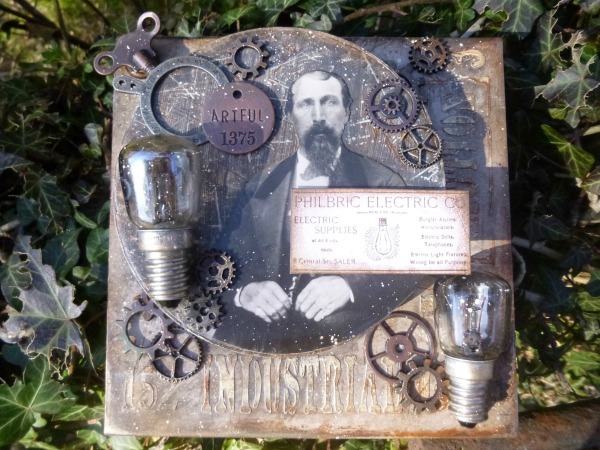 I only had a few days at home in which to get this made, but the theme set my mojo buzzing, and here’s what I ended up with. 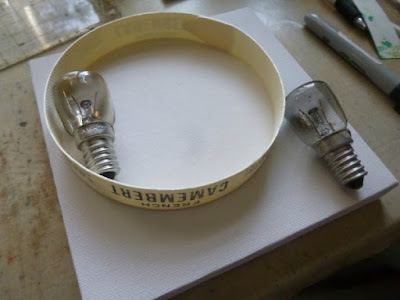 The trashy starting point was the lid of a Camembert box and these used lightbulbs from a small table-lamp which I laid on to a small 6x6 canvas and then let my crafty imagination go wandering. 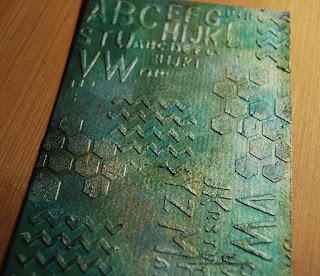 ... which I then coloured with various inks and paints and who-knows-what! 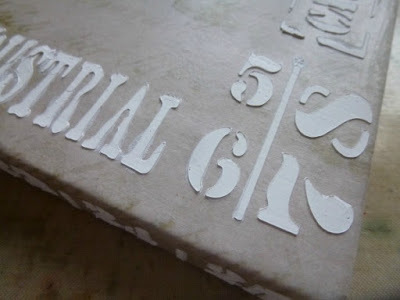 In the end, I couldn’t resist adding some more stencilled texture paste around the edge of the lid too. 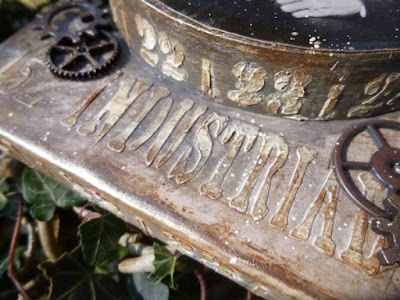 I painted the Camembert lid and added some stamping with the Andy Skinner Industrial stamps for a weathered look. 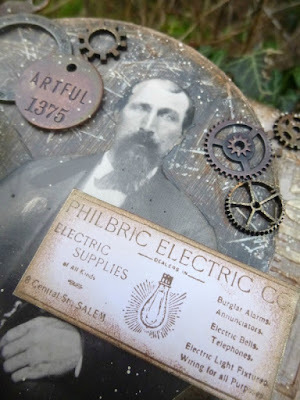 One of the Tim Holtz Found Relatives takes centre stage as the head of the Philbric Electric Company (that’s a TH stamp too). He’s made his fortune - an industrial magnate of great wealth. 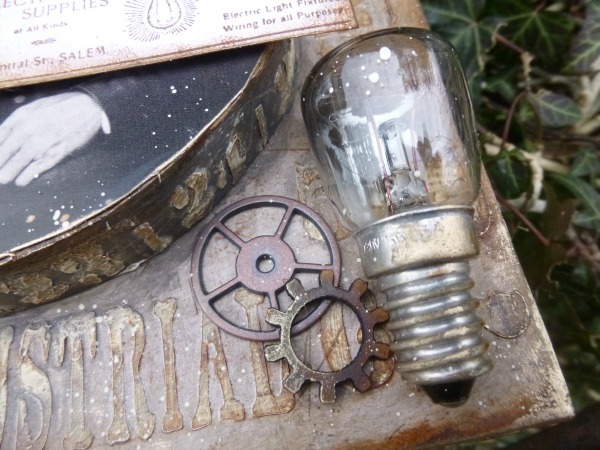 He’s surrounded by lots of cogs and gears and metalwork (I like how the round lid creates a frame which echoes all those other circular shapes), as well, of course, as those lightbulbs, with their aluminium slightly tinted with some gilding wax to give more of a bronze tone. 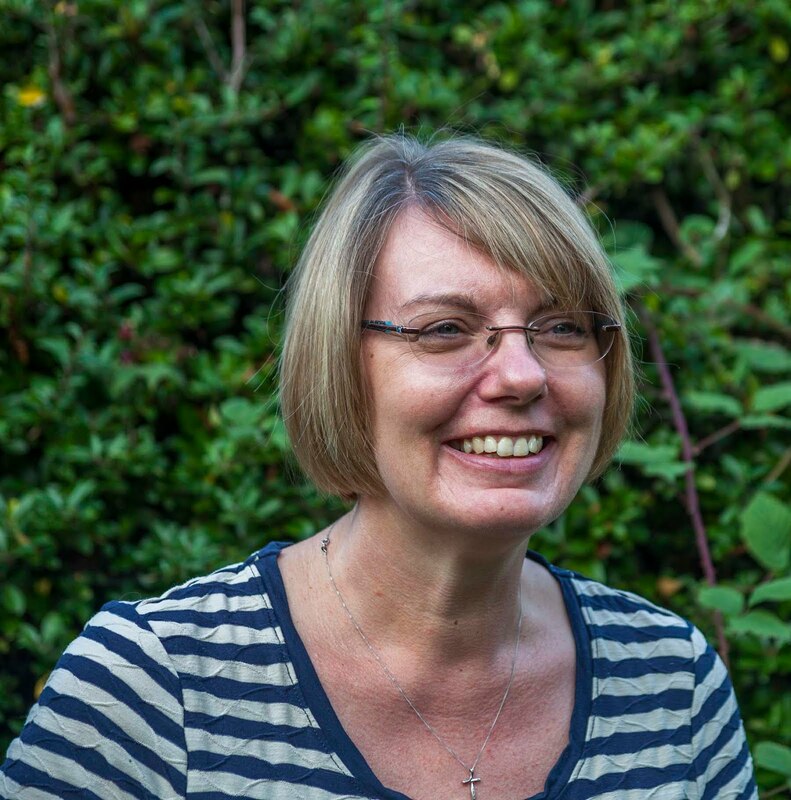 Huge thanks to Sue and the team for inviting me along this month. It’s been an absolute joy! 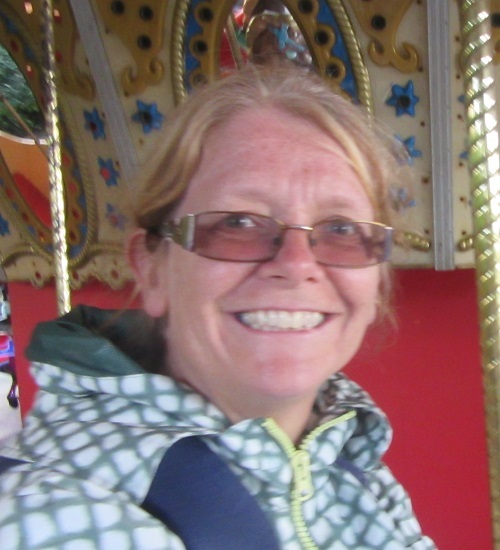 A huge thank you to you too Alison for fitting this into your very busy schedule ! 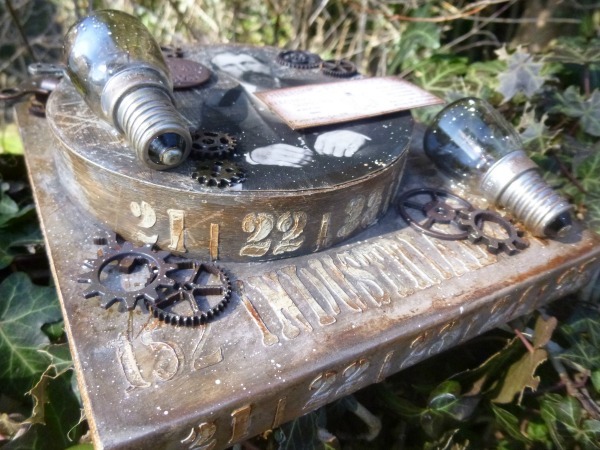 A stunning project and loads more inspiration for the current chalenge Trash to Treasure ! 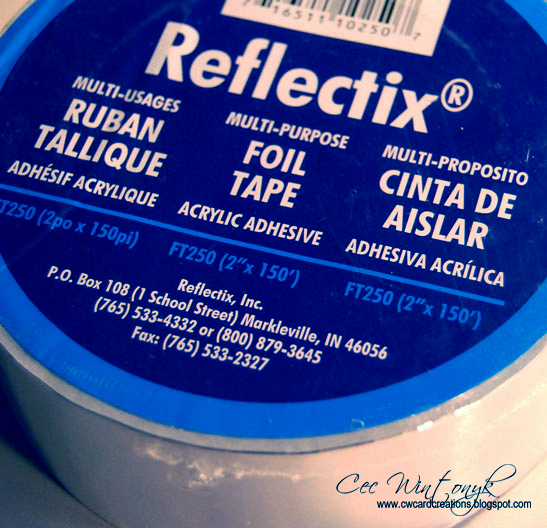 Hello, it is Cec here and I am bringing you the Inspirational Post this week. 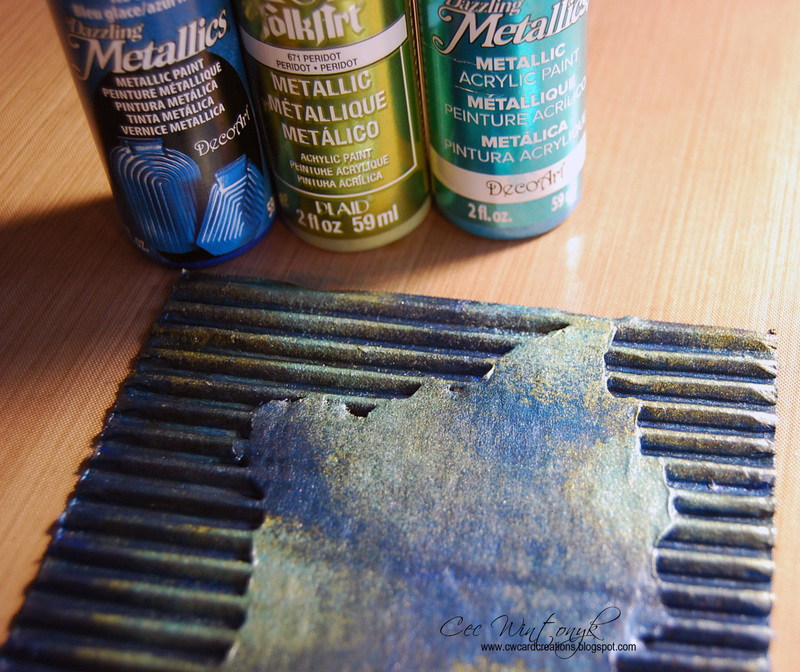 I thought I would show you how panels made of different materials can blend into one canvas. 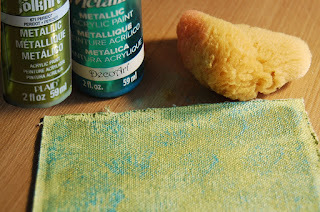 Here is how I made this canvas and there is lots to see so grab a cup (or glass) of something and start reading. 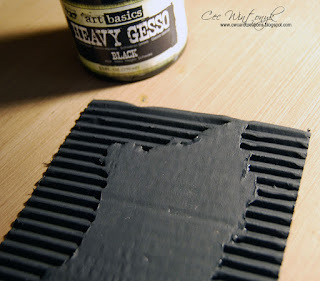 I started with a small piece of cardboard cut from a cracker box and coated it with Liquitex Gesso thinking I was going to do a light colour palette but changed my mind pretty quickly so I covered that with Art Basics Heavy Black Gesso that I patted with my palette knife to make it look bumpy. 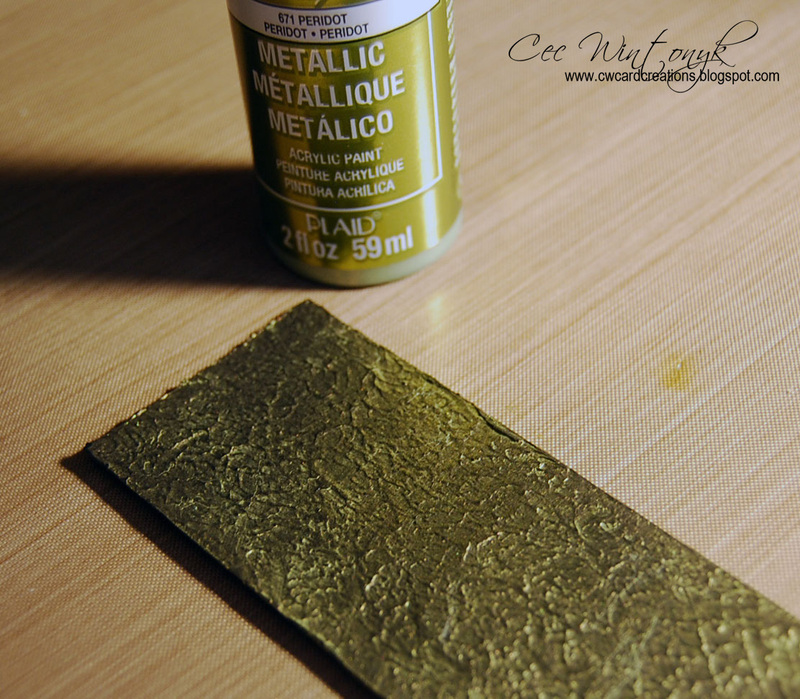 Next I painted it with some Folk Art Peridot Metallic Acrylic Paint. 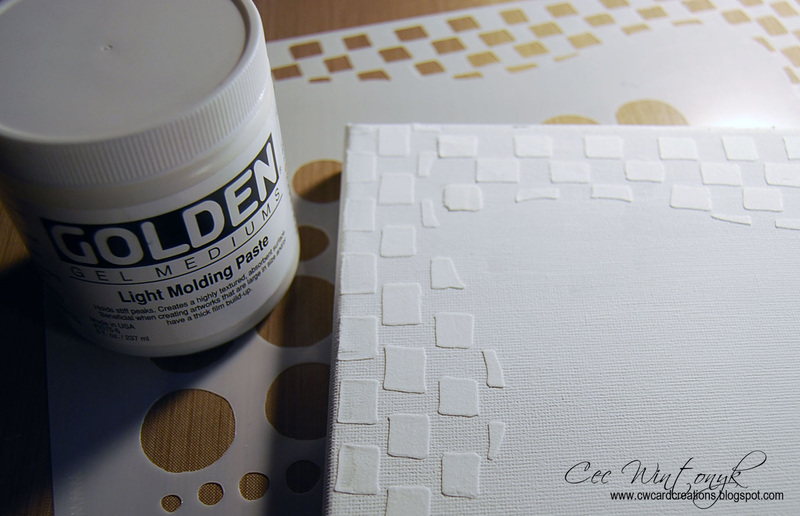 To make the fabric panel, I cut a piece of canvas, frayed the edges and glued it to a piece of heavy card stock for stability. 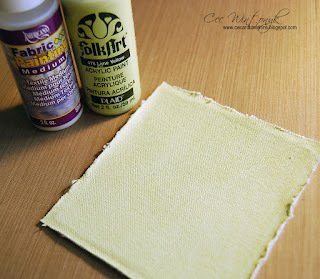 Next I painted it with a mixture of Folk Art Lime Yellow Acrylic Paint and DecoArt Fabric Medium. Then I used a natural sea sponge to dab on some Folk Art Peridot and DecoArt Peacock Pearl Metallic Acrylic Paint. 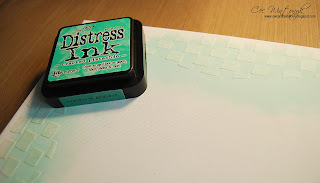 Next I used some Jet Black Archival Ink to stamp an image from Inkadinkadoo on a piece of tissue paper that had been crumpled up and smoothed back out. 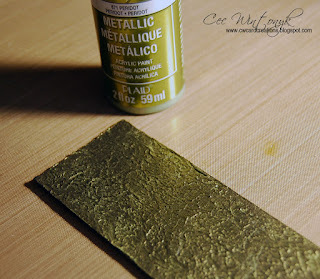 I used some Golden Fluid Matte Medium to adhere the image to the fabric. 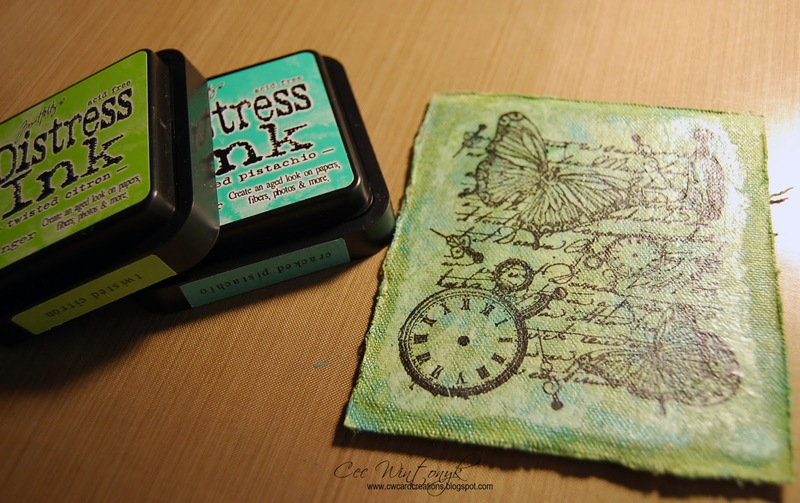 Once it was dry I inked over it with Twisted Citron and Cracked Pistachio Distress Ink. The next panel was made from corrugated cardboard. I ripped some of the top layer back and covered it with Art Basics Heavy Black Gesso. Once dry, I dabbed on DecoArt Ice Blue , DecoArt Peacock Pearl and Folk Art Peridot Metallic Acrylic Paint in that order. I used a piece from an empty cracker box for the next panel. 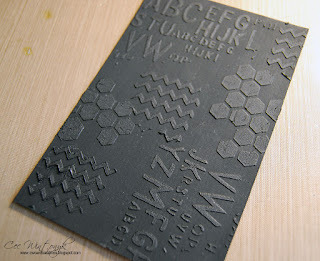 I coated it with the black Gesso and then I mixed Folk Art Black Acrylic Paint with Golden Light Molding Paste and used a Prima Zig Zag stencil, a TCW Mini Hexagons Stencil and a Dylusions 5"x8" Letter Jumble Stencil to add some embossing. Next I added colour with some DecoArt Peacock Pearl Metallic Acrylic Paint, Lindy's Glitz Spray in Gecko Green, Tim Holtz Tumbled Glass Distress Spray Stain and FW Silver Moss and Sun-Up Blue Acrylic Inks. I also went over everything with the Twisted Citron and Cracked Pistachio Distress Ink. I cut another piece of cracker box and covered it with metal foil tape used in the heating and air conditioning business. Then I took a sharp pencil and made designs on the foil through two TCW stencils called Mini Pattern Strips and Mini Geometric Art Layers. I went over all the markings with a very fine stylus. 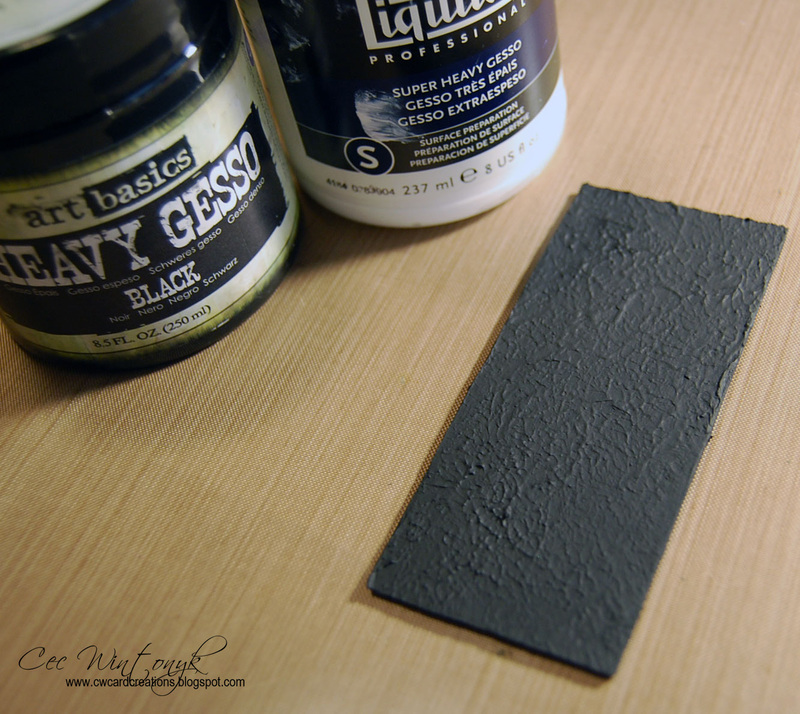 The next step was to coat it with DecoArt Black Acrylic Paint and wipe the paint off while it was still wet. I did this twice - sorry no photos because I forgot. 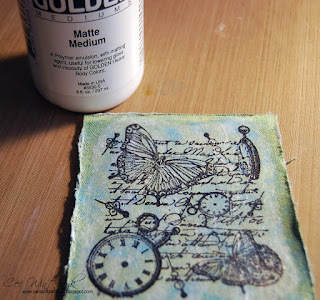 Next I put Aqua, Lettuce, Sailboat Blue and Meadow Alcohol Ink on a felt pad at the same time and coloured the metal tape. I used Jet Black Archival Ink and a stamp from Inkadinkadoo to stamp the feather on vellum. 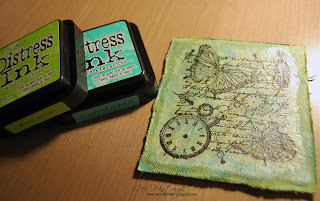 I turned the vellum over and coloured randomly with Twisted Citron, Broken China and Mermaid Lagoon Distress Crayons. 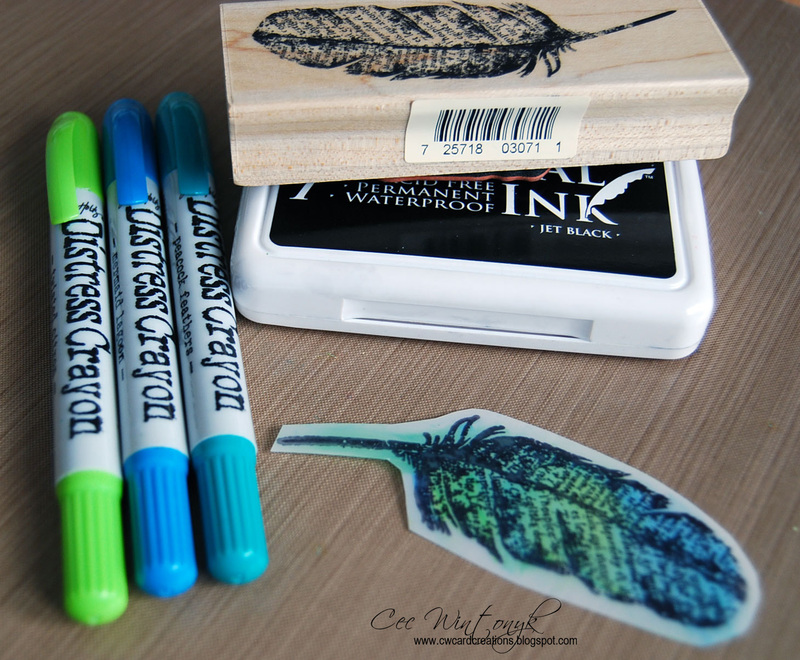 Then I used my fingers to spread the crayon around and blend the colour before I fussy cut around the feather. 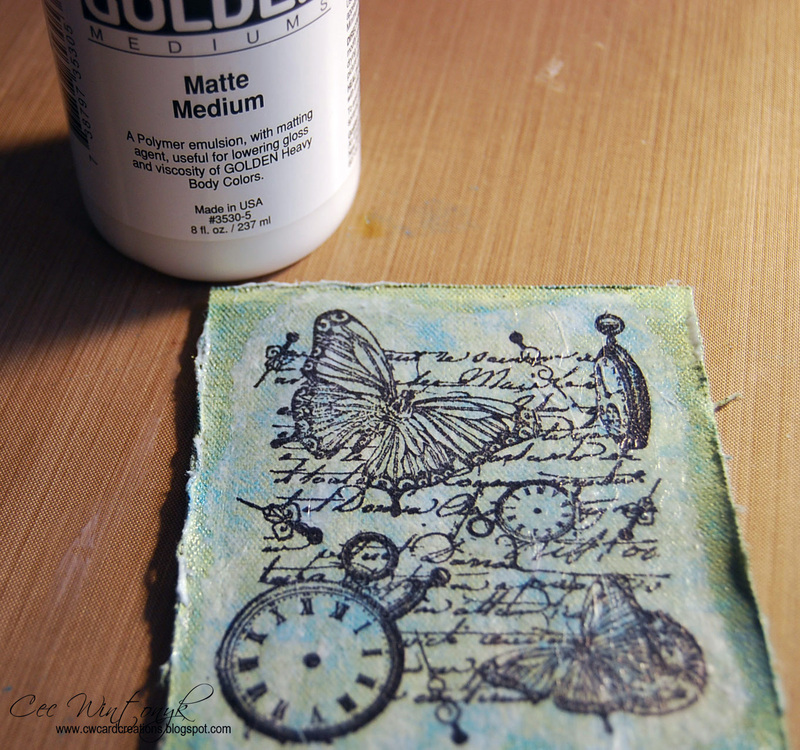 I repeated this process with a couple of butterfly stamps from a Hampton Arts set. 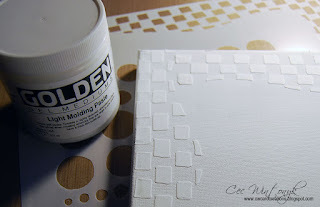 I prepared a 9" x 12" canvas that I picked up at the dollar store by coating it with Liquitex Gesso and then I used some Golden Light Molding Paste to add some texture through a Dylusions stencil called Checkered Dots. 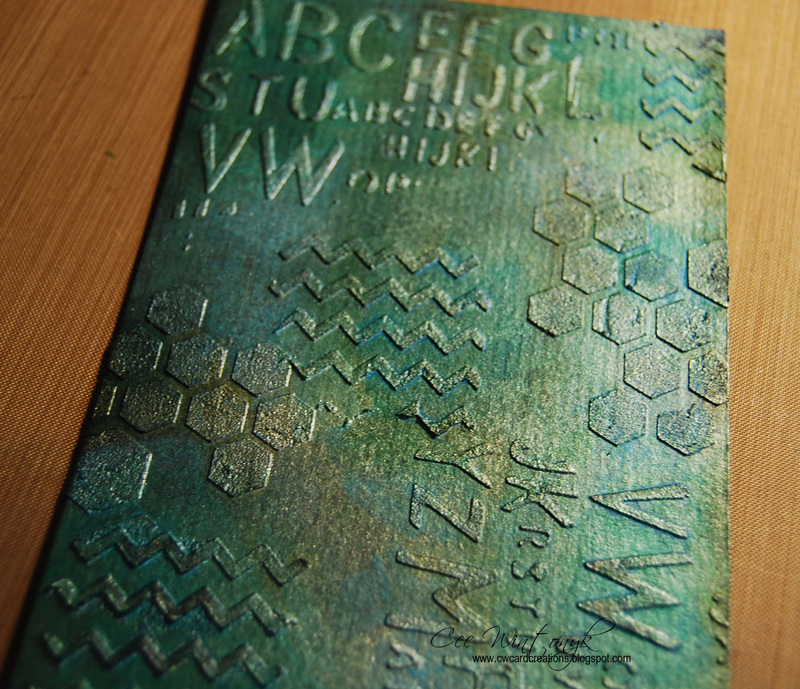 Next I added some Cracked Pistachio Distress Ink around the edges but in a bit. 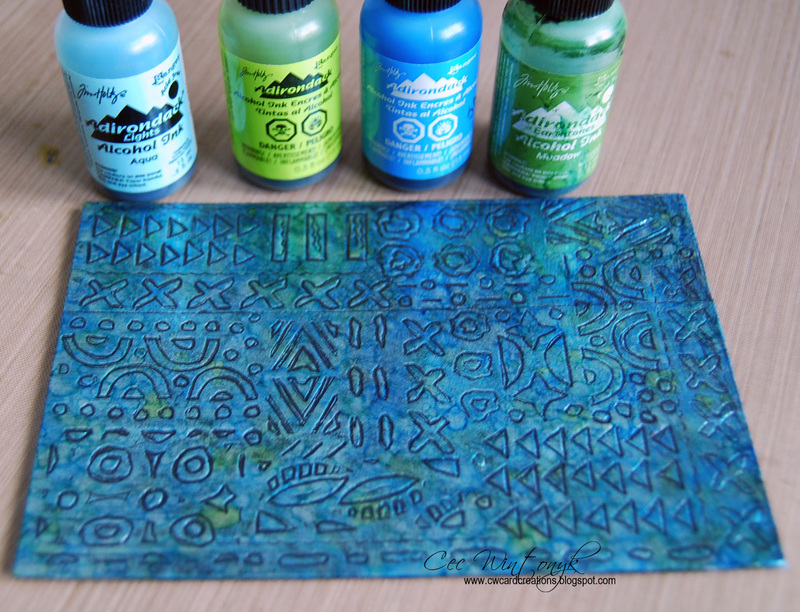 The next step was to lay out the panels but when I did I discovered that the colours of the panels weren't unified enough for my liking so I went at them with some Lindy's Magicals in My Mojito Green and Blue Hawaiian Blue as well as some of the ink sprays and Black Soot Distress Ink until I thought they blended well together. I also decided to lighten up the colour on the canvas so I went over it with a couple coats of Gesso until there was just a pale tint showing. All the panels were then added with Matte Medium and Foam Strips for the ones I wanted to be raised up a bit. Well, that is my panel canvas in a nutshell and I hope I have inspired you to play with a variety of substrates and use inks, paints, stamps and stencils to create different panels that can be used alone or together.